Setting up a conversion funnel is a great way to see how well you are converting on your website, and where you can improve. A funnel is a visualization of the steps you want people to take on your website. For example, the top of the funnel would be visiting your homepage, and the bottom would be hitting the purchase confirmation page. You can add steps in between as well, like visiting your pricing page, reading a blog post, or subscribing to your email list. A conversion funnel doesn’t have to be monetary, it could also show how well you are doing with email opt-ins, downloads, social sharing, and more. If you read my previous post on basic growth hacking, setting up a conversion funnel in Google Analytics is a great first step. Let’s set one up. Assuming you already have Google Analytics installed on your site, login to your account and go to one of your web properties. 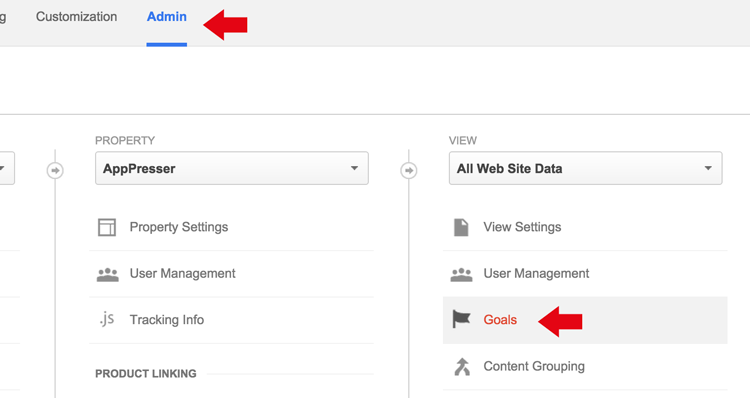 First, you’ll need to create a goal, so click on the “Admin” menu item. Next, click “goals” under “All web site data,” as pictured below. Click “create new goal,” this is where you’ll add the steps for your funnel. Destination: This is the page people will visit when they have converted. It could be your purchase confirmation page, thank you page, or any other page. Value: You can assign a monetary value to the conversion if you like, although it’s difficult if you have more than one product or price. 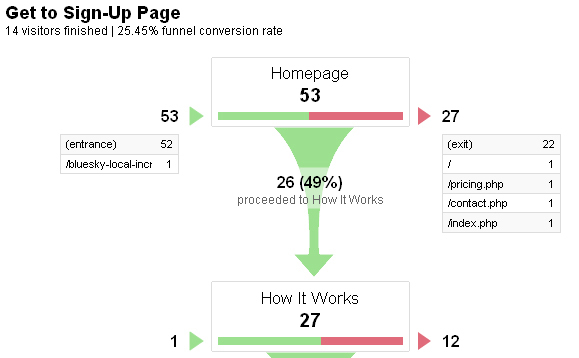 Funnel: This is where you enter the steps that precede the conversion. For example, your homepage, pricing page, blog, etc. You should add a few key pages so that you can see where people enter your funnel, and where they drop off. These steps are all optional, unless you switch the “required” button to “yes.” If required is turned on, only the first step of the funnel is required. For example, if the first step is your homepage, and you turn on required, then visitors who don’t visit your homepage won’t be recorded in your funnel. I would recommend you turn this off unless you have a special use case. After you’ve finished entering your funnel steps, save the goal. Once your goal is created, you need to give it some time to start gathering data. You can view your funnel by going back to Reporting, and clicking Conversions in the left sidebar. 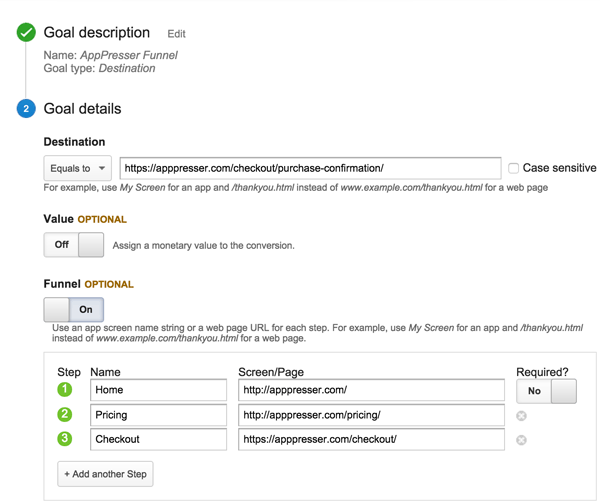 Expand the Goals item, and click Funnel Visualization. You’ll see a funnel that looks something like this. You can now see the number of people going through your funnel, where they are dropping off, and your funnel conversion rate. Setting up a funnel is important so you can measure and optimize your conversions. Even if you aren’t going to do anything with it right away, it’s important to set it up so that you have data to work with later. Now when you make changes or run tests on your site, you can keep track of historical conversion data.